Moving with cats to a new home? Here are seven tips to make moving less stressful for furry family members. Thank you to The J.M. Smucker Company for sponsoring today’s post. It’s easy for us to envision our two cats napping in the sunbeams of our new home, but the transition for them will be anything but easy. You see, cats develop strong bonds with their environment, which makes changing homes stressful for them on multiple levels. 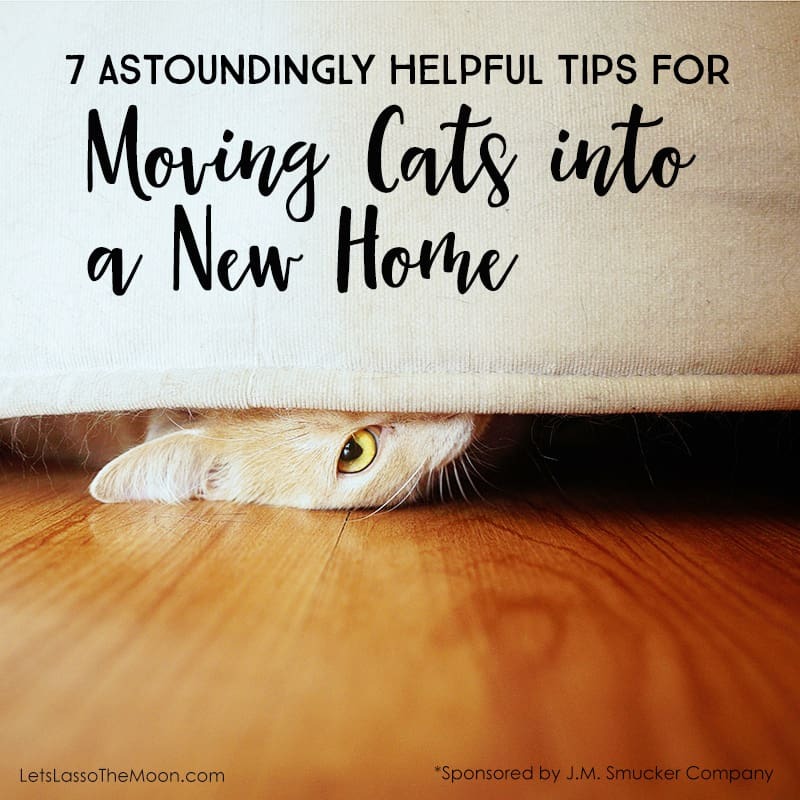 Below are seven simple things you can do to help soothe your cat’s anxiety during a move to a new home. After nine years at our current home, our family—including our two older cats—is moving into a new house. Our super-sweet tuxedo cat (named Cement Truck Mixer, no lie) and our sassy tortoise cat (whom we affectionately call Pumpernickel) have been an important part of our family for fifteen years. We want to make the transition to our new home as smooth as possible for them. So, you’re moving, too, eh? 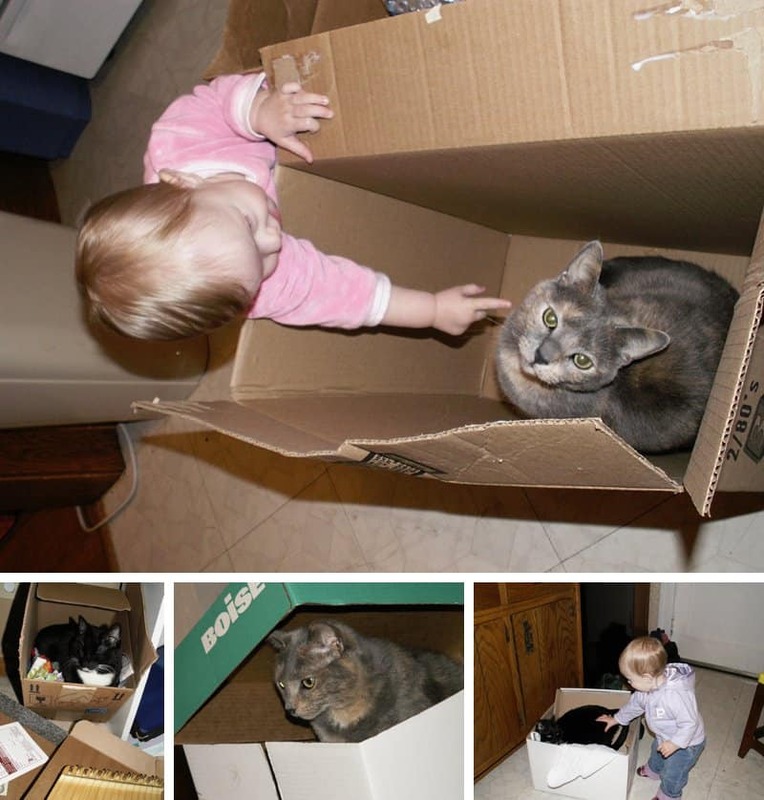 Here are a few tips to help make moving with cats easier on you (and your feline friends). 1. If you are sensing anxiety and wondering how to destress a cat, consider pheromone therapy. Start the pheromones as soon as you begin packing your belongings, use them during the transfer, and continue using pheromone therapy while settling into your new home. There are many ways to deliver calming pheromones to your cat. Pheromone diffusers, sprays, and wipes can all help your cat deal with the anxiety of moving. Our cats seem to be responding best to pheromone-based calming collars. The other products are certainly useful, but a pheromone collar is always with your cat, so it’s just naturally more effective. 2. Keeping your daily routine stable when moving house with a cat is important. While you prep for moving, you’ll likely be extra-busy running errands, cleaning things out, and packing up boxes. 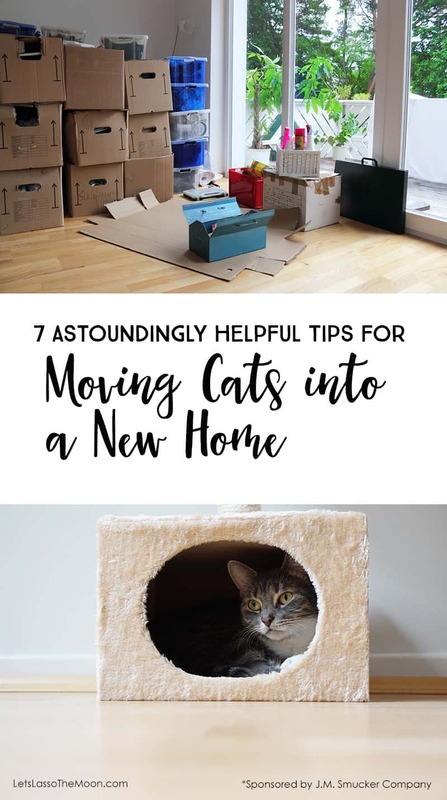 Throughout your transition to your new home, it’s important to try to keep some consistency to your cat’s day-to-day routine in terms of feeding, play, and attention. For our family, this means morning and evening snuggles each day, as well as after-school playtime. 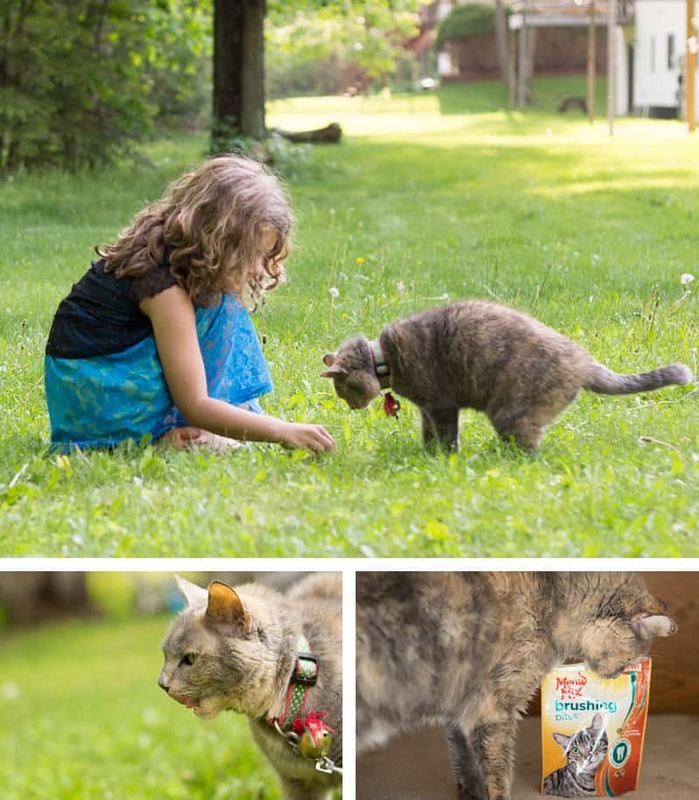 When packing was underway, my daughters were sweet about giving our two cats lots of extra love (and treats!). That’s right—A gallon of Vitamin D and Calcium-fortified milk for the kiddos AND fortified Vitamin D and Calcium treats for the cats. It’s strong teeth and bones for the whole family now. 3. When you are moving house with a cat, you want to keep them restricted to a safe room on the big day. Keep your cat restricted to one safe room in your old home that is quiet and less chaotic (for example, a spare bathroom or a laundry room). Be sure to provide food, water, a bed, and a litter box all in that contained space. To prevent your cat from accidentally dashing out the door while you’re working and going in and out, tape a “Kitty Room: Please Keep Door Shut!” sign up on that room for movers, friends, or family. You’re going to want to do the same thing at your new place, too! 4. Consider a mild sedative for cat transport, if you’re going a long distance or your cat is highly-anxious. When you’re ready to make the transfer, be sure to use a car-safe cat carrier. Your cat will be anxious from all the commotion, so it’s important to have him or her in a secure carrier. If you’ll be traveling a great distance and your cat hates to drive (…er, make that hates to ride), consider talking with your vet about getting a mild sedative. This is something our veterinarian offered for our more anxious cat. Take things slow and introduce one room at a time. How quickly you open up exploration depends on your little feline’s unique personality. If she’s fearless (like our tortoise cat, Pumpernickel), let her explore her new place and get the lay of the land. 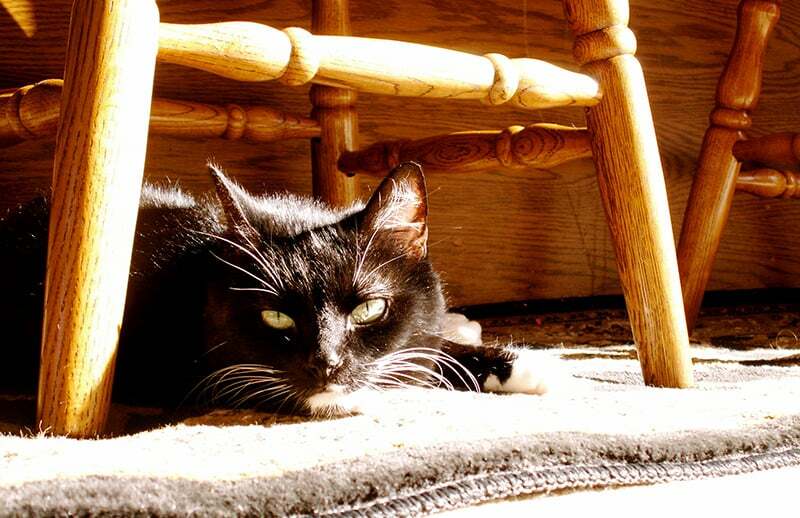 If he’s more timid (like our tuxedo cat, Mixer), keep the transition gradual and slow. Pick a dedicated “cat-introduction room” at the new house that will remain relatively calm and quiet. Before letting your cat out of the carrier, make sure the cat’s food, water dishes, litter box, and bed are all situated. 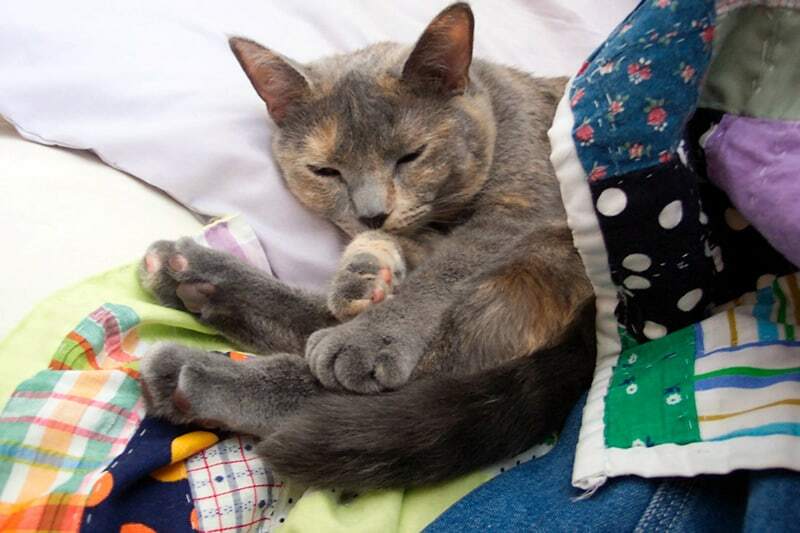 You want to set up a comfy, cozy, safe place… so make sure to have a few of your cat’s favorite things in the room (bed, toys, etc.). You could also place some cat treats around the room to encourage him to explore the new environment. 7. Slowly introduce new rooms when moving with pets. Slowly introduce your cat to new rooms while snuggling her and doing low-key activities like reading or watching TV. 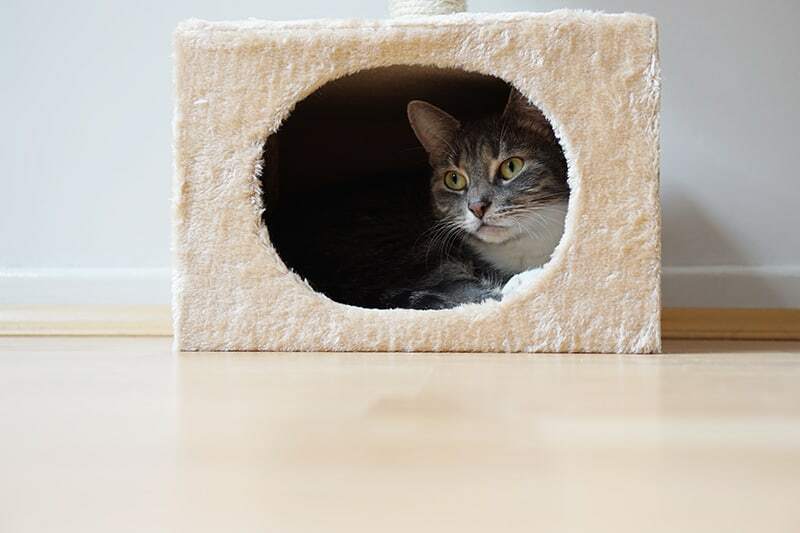 When she begins to explore, offer your cat attention, and perhaps some extra cat treats at playtime to make her feel loved and comfortable in your new home. BONUS TIP: Take a clean sock or washcloth and gently pet your cat around the mouth. Next, rub those facial pheromones on the corners of objects around the house at the height of your cat’s nose. Do this several times, until you start to see your cat rubbing his pheromones on places around the house all on his own. 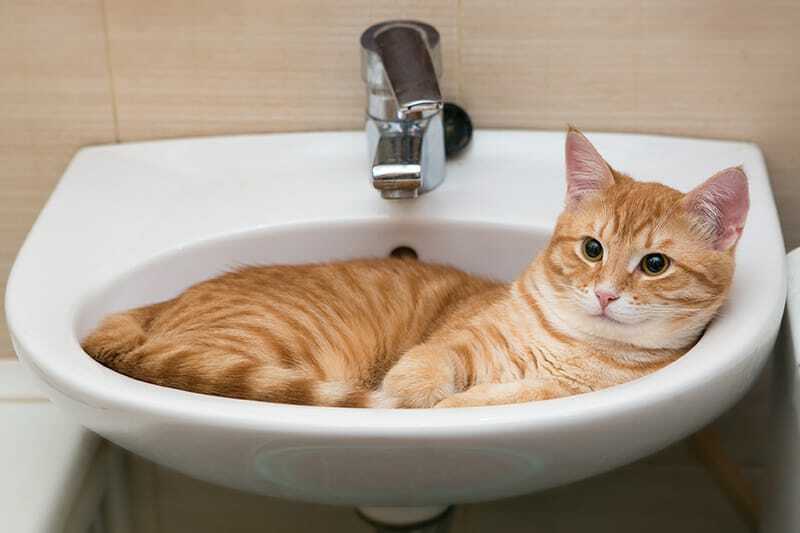 Be careful about allowing your cat unsupervised time in the kitchen or in utility rooms; nervous cats often seek refuge in narrow gaps behind appliances or areas that could house electrical wires. Ensure that all the windows at your new home have secure screens before letting your cat roam free. You don’t want him wandering out a loose window screen trying to explore. 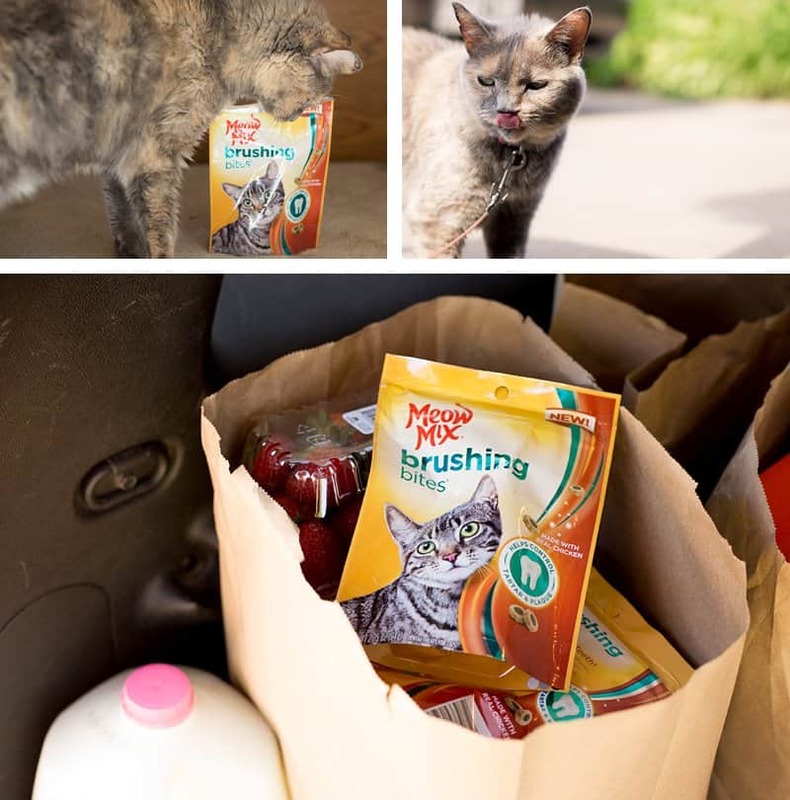 Big thanks to Meow Mix Brushing Bites for sponsoring today’s post. My kids love being able to “spoil” our cats with these tasty treats. Other than just checking windows, you should also check to make sure there is nowhere your cat could escape. Make sure your fence in the backyard doesn’t have any openings where the cat could escape. You don’t want to believe your cat is safe outside, only to realize that she was able to sneak through the fence! Thanks for this blog! We understand your love towards your cats. If you want to shift your cats, then we are perfect remedy. We manage them with highest proper care, and shift your pet where you want. We know how much sensitive cats are. So our group going to deal with your cats and shift them. Transport medium is chooses according to the cat. Attractive section of content. Thank you for your post. It is a really informative and useful article. And I am glad to know the pheromone therapy. I will be moving next month to a new home and very worried about my pet. The above tips could be very helpful for me. It is going to be a very difficult month for me.